Southern Chile´s at times complex geography makes some places isolated and hard to reach… but for us nothing is impossible and this can make them even more attractive to explore. 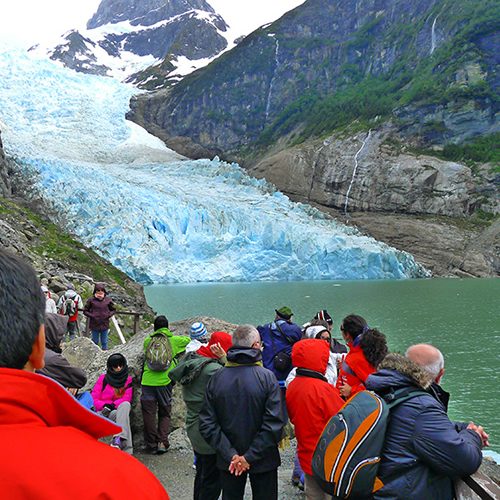 Aboard a cruise you can explore unspoilt areas, navigate through unique channels, fjords and even around glaciers! The invitation stands out to discover the areas of Patagonia and Antarctica where no one has been before, to try fly-fishing or even skiing on unchartered slopes, and get up close with native flora and fauna. 1 hour and 45 minutes flight from Santiago and 13 miles/21 km (25 minutes by car). 1 hour and 45 minutes flight from Santiago to el Tepual Airport, transfer to port facilities. 3 ½ hour flight from Santiago to Punta Arenas and 150 miles/247 km (3 hours by car). 3 ½ hour flight from Santiago. 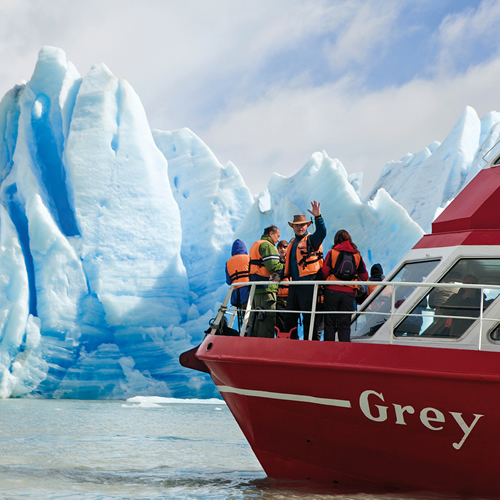 We depart on a sailing from Hotel Lago Grey to appreciate the glacier of the same name, a natural wonder of imposing dimensions that forms part of the southern extreme of the Continental Southern Ice Field (Campo de Hielo Sur). On this journey of three hours duration will allow us enjoy the unique landscape with floating icebergs, towering mountains and lush vegetation. Among the numerous floating icebergs, the boat will sail right in front of the Grey Glacier, which is divided by a central island, a place where disembarkation is allowed and from where it is possible to appreciate the full extent of the countless cracks and uprisings that constitute the glacier and which sight is lost in the distance. After our cruise, it is time to return to Hotel Lago Grey. 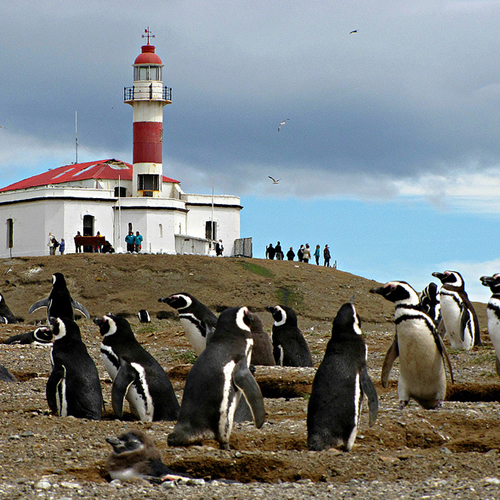 Depart from Punta Arenas to sail across the Strait of Magellan towards Penguins National Monument. This island has a population of 150.000 penguins coexisting with an abundant marine avifauna from November to March. Once we arrive at this place, it is also possible to enjoy of the presence of species like the cormorant, the austral seagull or the Skua, aside from sea mammals like the sea lions. Finally we will return to Punta Arenas. Depart from Puerto Natales to go to the pier from where we will on the boat to the glaciers. We will sail through the Fjord Ultima Esperanza, from where we will admire the beautiful mountains, waterfalls, residences, and Patagonian birdlife. Before midday we will reach the Balmaceda Glacier, which stands out for its untamed beauty. Later, we will arrived at Serrano Glacier, where it is possible to disembark to enjoy a walk through a forest of native coigüe and canelo trees, and reach the feet of the glacier. Then we wil enjoy a tipical lunch of the area. In the afternoon we will return to Puerto Natales. 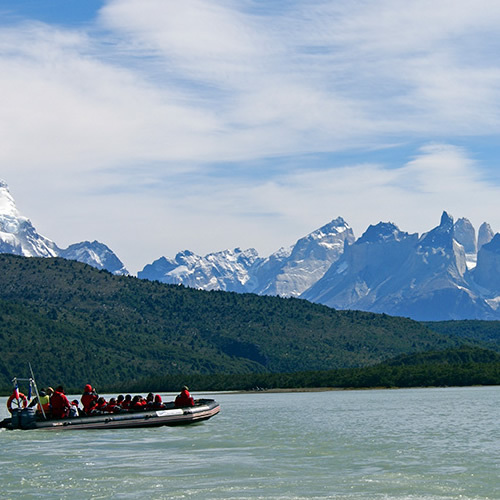 Depart from Puerto Natales towards the dock from where the ship will sail upstream towards the Balmaceda and Serrano glaciers, across the Última Esperanza Fjord (Last Hope Fjord), admiring the beautiful mountains, cascades, farms and the Patagonian birdlife. Next, we will board a zodiac boat to sail through Río Serrano. This is a fabulous trip with great views over the Southern Ice Field and native Patagonian forests. Arrival to Torres del Paine, after we spend some time around the area, a transfer will be waiting to take us to our hotel.